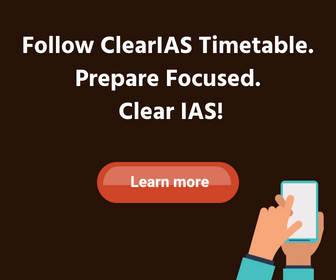 “What is the best strategy to clear IAS Preliminary exam?” If you ask us this question, we would say – join ClearIAS prelims mock test series. Many toppers had repeatedly acknowledged the role of ClearIAS Prelims Test Series in their success. The story was no different in Prelims 2016. More than 100 marks worth questions were asked in Prelims 2016 – directly or indirectly – which had asked in ClearIAS Prelims Test Series 2016 before. This had helped a lot of our students who enrolled for ClearIAS Prelims Test Series 2016 to clear UPSC Prelims 2016 with ease. Every mark scored was crucial: Union Public Service Commission (UPSC) has conducted the Civil Services (preliminary) examination on August 7, 2016. A record number (11.37 lakh) of aspirants had applied for this year exam, and with less number of seats, it was fierce competition. Every mark scored was crucial. Scroll down to see the list of questions covered by ClearIAS which appeared in Prelims 2016. 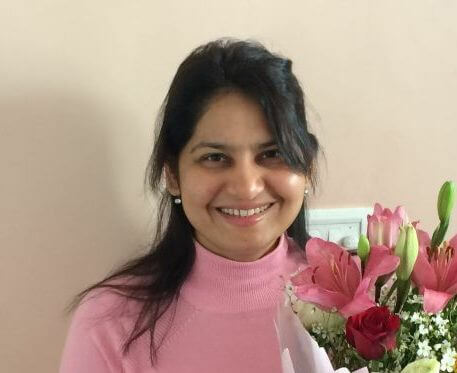 Doing more with less: More than 50000 aspirants had registered in ClearIAS mock test platform and had been practicing mock questions daily making it one of the most popular platforms for IAS exam preparation. Out of around 1600 questions we provided, questions worth around 100 marks were asked in UPSC CSE Prelims 2016. Many of our selections and intuitions turned right. This is what we mean by right guidance and focused approach. High conversion ratio and return on investment: 14 questions came in UPSC Prelims 2016 from a single mock test of ClearIAS (304P – Current Affairs). This means that – had aspirants gone through just these 100 questions in 2 hours, they could have scored at least 28 marks! List of questions from ClearIAS which appeared in UPSC CSE Prelims 2016: We have made a quick recap of the questions in ClearIAS mock tests or study materials which appeared in UPSC Prelims 2016. 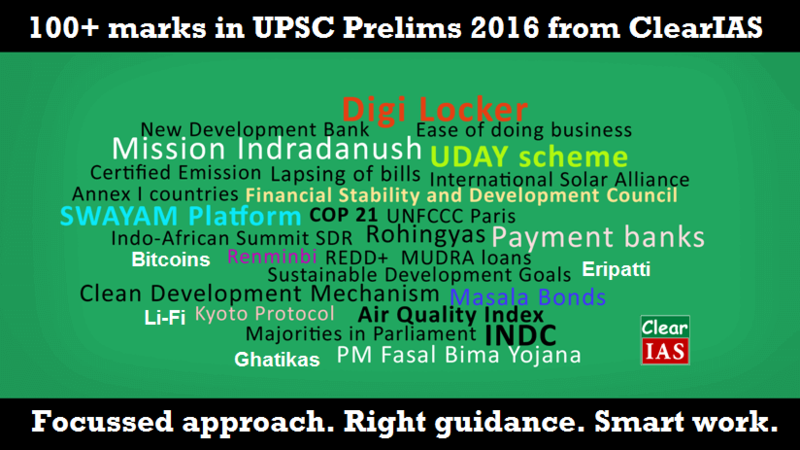 The full details are also available in the solution part of UPSC Prelims 2016 Re-take test as well. When will a bill lapse? Lapsing of bills (special article). Pradan Mantri Fasal Bima Yojana. Our philosophy is to reduce the workload of IAS aspirants, not to increase it! The hollow claim of many institutes/websites: Many players copy paste almost everything from ‘The Hindu’, PIB, India Year Book, Economic Survey, Yojana, Kurukshetra etc and claim that many questions came from their study materials or tests. Intelligent aspirants can easily realize how hollow this claim is. This claim is similar to creating a 50,000-page book and claiming that questions from 5 pages of it are asked in UPSC exam. Many institutes/websites increase the workload of aspirants: As you know, it is not an easy task to cover every minute details in these voluminous resources from an exam point of view. Coaching should make things easy, not difficult. If volume/quantity of materials is the case, then ‘PIB’, ‘The Hindu’ newspaper or ‘Wikipedia’ can claim the maximum number of questions for Prelims and Mains as they are exhaustive. But aspirants should think how practical it is to revise huge resources within the limited time. What is needed is the focused and smart approach: It’s the philosophy of ClearIAS team, not to overburden our students and readers with too many materials. We believe in focused and smart approach. 28 marks from a single mock test! Last year (2016), 14 questions in actual UPSC CSE Prelims could have been answered from a single current affairs mock test of ClearIAS (304P – Current Affairs)! This means that – had aspirants gone through just these 100 questions in 2 hours, they could have scored at least 28 marks in UPSC Prelims! Every mark counts! Aspirants who are near the cut-off score know what difference even 2 marks can actually make. Last year many candidates missed cut-off by decimal marks. The volume of materials is not always proportional to your marks! It’s common sense that the more materials one institute provide, the probability of more questions to come from them increase – though not always proportional. Very often, aspirants read thousands of pages of study materials without getting a single question from it. Time is limited! It’s not practical to go through all materials as the volume increases. One needs to be super-sharp to remain focused. 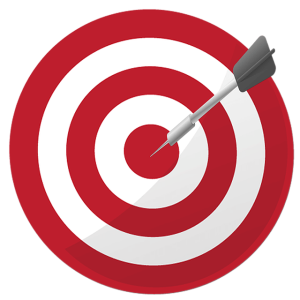 We are bang on target! Most probable questions: ClearIAS had provided only 11 full-topic mock tests and only 5 subject-specific mock tests for Prelims 2016. This means just 1600 questions. If we add our re-take option on UPSC Previous Year mock questions and CSAT, the total would come only around 2200 questions. But the returns on investment on these 2200 questions was really great! Work smart: Ideally, coaching gurus should help aspirants to ‘separate the wheat from the chaff’. But the opposite is seen happening. Smart aspirants realize the value of ClearIAS.com service in simplifying IAS exam preparation – doing more with less! This is what the last year toppers too have appreciated. Thank you emails: Since exam day, we have been receiving many emails thanking us for providing the most probable questions via ClearIAS Prelims Test Series, emails and ClearIAS free online study materials for UPSC Prelims 2016. We feel happy that our special approach for prelims giving rich dividends to our users/readers. I m getting 118. gen. category. What are my chances? Is this as per ClearIAS key? If then, reasonably good chance. i am getting 114 as per clear ias key.. what are my chances? Good chance. Prepare for Mains. All the best! I am preparing for CSE 2017. May I know if you have a full program. And can you please share the link for test series 2017. We will be officially launching ClearIAS Prelims Test Series 2017 within 1 week. But you can enroll now for the same now at http://www.cleariasexam.com. We will also be launching ClearIAS mains test series 2016 soon. I am getting 107.27 ; obc ; What are the chances ? The initial scores reported by candidates are a little on the higher side. We need to wait and see the all-India trend. You can compare the performance of those candidates who entered their marks in 2015 and 2016 at ClearIAS mock exam platform in this link – http://www.cleariasexam.com/category/toppers/. But, this is a small sample size to make any accurate predictions. Let’s hope for the best! Dear Sir. I have been a regular follower of your site. M scoring 107.5 (precisely 107.33) from your key. Cat. General. M worried. What are the chances? Sir.can you provide some data on DBT and direct cash transfer. both are confusing me. I scored 92 marks in st category. What are the chanse? Last year the ST cut was around 91. So let’s be hopeful. I am preparing for civil services 2017 do u have full program for hindi medium aspirant??? At the moment our programs are only in English. I am in +3 1st SC. I want to start my preparation from now. what should I do first. give me the list of books that’s necessary for preparation. I’m doing bsc and feeling inspired to prepare for CSE but my current status of social sciences is not good. If i prepare for it now would it be great for me . Can you give me some video link or link from where ican get details regarding the same? My son score 101.48 for general catg. What is his chance? @Arindam: Every optional paper has almost equal chance. It all depends on your taste. I’m working professional preparing for 2017 UPSC CSE. I’ve covered the majority of the portion and in the phase of revision. I want to enroll in your mock test series, before doing that i want to confirm if you provide explanation after completion of each test.. Please reply. Yes, we give explanation after completion of each test. The key and explanation part is also available under ‘My Account’ link for future revision also. Hi, my self priyank sharma this is my attempt for IAS prelims,my math is not very good , but i read daily current affairs and some historical question and answer and i m unable to join any coaching as i m working in a private company. so please suggest can i clear IAS or not.